You'll be £10.00 closer to your next £10.00 credit when you purchase Defending Heaven. What's this? This absorbing new history explores the epic struggle between the most powerful empires of the medieval world: the Mongols and the mighty Chinese Jin, Song and Ming dynasties. The resistance of the Chinese dynasties to the Khans is a complex and rich saga of shifting alliances and political scheming, vast armies and navies, bloody battles and an astonishing technological revolution. Defending Heaven brings together, for the first time in one volume, a complete history of China's Mongol Wars in all their ferocious and fascinating detail. Setting the conflict in the wider context of China's ancient and almost perpetual conflict with the northern nomads, it sheds intriguing new light on the evolution of China's military society and the management, command and control of the army by the Chinese state. Combining powerful and accessible narrative with illuminating judgements, this book complements James Waterson's earlier works which cover the Islamic world's conflict with the Mongol superpower. It places the war in China within a truly international setting and demonstrates the vital importance of the long confrontation between the Khans and Emperors for medieval and early modern Eurasian history. A very readable account of the protracted, and ultimately unsuccessful efforts of the Song, Xia, and Jin dynasties to defend China from the Mongols. [Defending Heaven] will satisfy the more seasoned student of Chinese history. 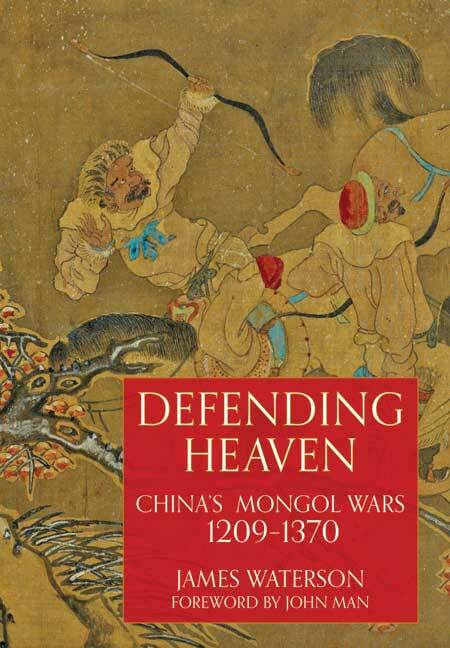 Defending Heaven is a very readable account of the protracted and ultimately unsuccessful efforts of the Song, Xia, and Jin dynasties to defend China from the Mongols, a conflict with some episodes so heroic Waterson, a specialist in Mongol history, suggests they stand in need of a Homer. Recognizing that Westerners are most likely unfamiliar with the historical, cultural, social, and military background of these events, Waterson wisely prefaces the book with what would normally be appendices, such as a chronology, dynastic tables, and so on, to provide a firmer foundation for readers new to the subject. These are followed by his opening chapter, which provides an overview of the state of the several Chinese kingdoms on the eve of rise of the Mongol threat. Waterson then covers the various phases of the protracted Mongol conquest of China, and ends with a look at the Mongol dominion (the Yuan Dynasty) and its long-term influence on Chinese history. Waterson’s treatment is clear, a considerable achievement considering the often very complex ways in which events unfolded. He links the events in China to contemporary developments in the rest of the world, sometimes in startling ways (e.g., the “movements” of the trebuchet). Waterson often explains events in China by comparing them with similar developments in other parts of the world, which is a considerable help for anyone who is a novice to Chinese history. And Waterson is not shy about criticizing Western perceptions of China (e.g., just how familiar were Chinese generals with Sun-Tzu?). Defending Heaven is a good read for such novices, but also will satisfy the more seasoned student of Chinese history. Waterson does an excellent job of guiding us through this prolonged and complex period of warfare, focusing on the key personalities as well as the main campaigns and the differing military establishments. He avoids getting bogged down in detailed descriptions of many battles or sieges, although the six year long siege of the twin cities of Xiangyang and Fancheng get the prominence they deserve, as does the final naval battle that seals the fate of the main Song Dynasty. This allows the main narrative to flow better, and gives us a clearer picture of the overall sweep of events in this dramatic period. Waterson’s Defending Heaven is an excellent contribution not only to the study of the Mongol Empire but also to military history. Generally speaking, the Song have been portrayed as being pathetically inept in warfare but Waterson’s nuanced narrative clearly demonstrates that although the Song could not defeat the Mongols in an open battle, they more than held their own in defensive capabilities. With five maps, thirty-three illustrations, a lengthy timeline and dynastic charts, Defending Heaven is an excellent resource . . . Anyone interested in medieval warfare will find Defending Heaven of interest. This book is about one of the most significant events of the last millennium, yet it is – to westerners – one of the least known. The events related in this book are key not only to an understanding of the past but to the future as well. The study of the Mongol conquests of the 13th century and of the history of their empire has flourished greatly in recent years. Yet until now there has not been a book which relates what happened from the point of view of the invaded and conquered states of what is now China. This is what James Waterson, with the knowledge, lucidity and approachability we have come to expect of him, provides in Defending Heaven. It is a remarkable story, superbly well told.